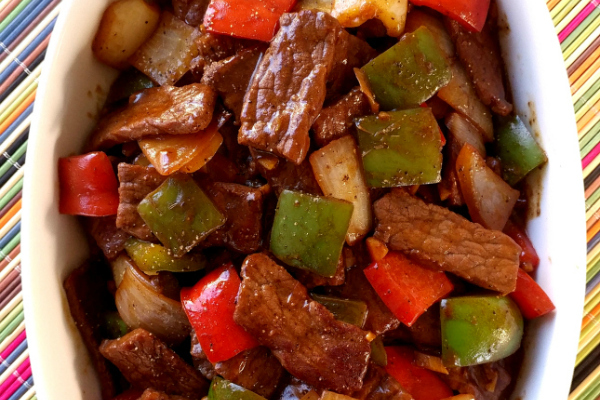 Super easy Pepper Steak recipe with sauteed steak strips, peppers and onions. PERFECT over rice! When I can cook an entrée in less time than it takes me to cook a small pot of rice, I am one happy mama! This is a dish I grew up eating which, now that I think about it, seems odd considering I grew up waaaaaay out the country in the middle of the Deep South. We didn't make this with Chinese take-out in mind, we made this to use up all the peppers that our gardens were pumping out. While I don’t necessarily think of this as “Chinese food”, you can certainly nudge it closer in that direction by adding more ginger and a little sugar to the sauce when you mix it up (I’d say double the ginger and add about a tablespoon of brown sugar). 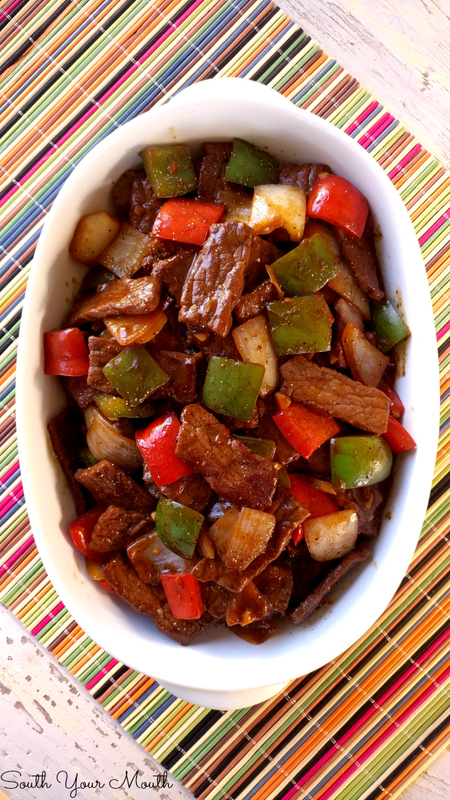 I made a note of this in the recipe below but if you’re planning to serve this with rice (which I highly recommend) you better get that rice going before you start cooking your pepper steak because this dish comes together quickly! We used to always make it with a cornstarch slurry but I started using a brown gravy mix because it adds just a little more beefy flavor (and that’s all gravy mixes really are: cornstarch and bullion). If you want enough to sauce to cover your rice like gravy, double the sauce recipe! If you’re looking for something quick and easy for weeknight meals, you’ll love this one! Don’t look at the ingredient list and think it’s too much. Most of the ingredients in the sauce are the same things you use on the steak, I just separated them into two sections to make things easier to follow! 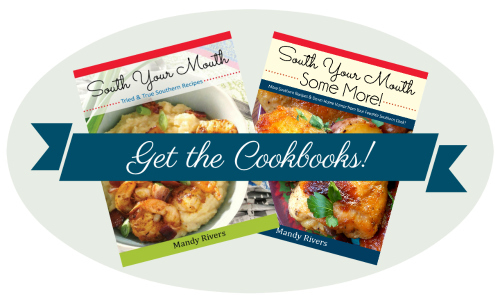 Here are a few other recipes with similar ingredients and flavor that you might also enjoy! Slice steak into 1/4-inch strips then toss with soy sauce and black pepper. You can cook this strait away or let it marinate up to 8 hours. If you’re planning to serve this with rice, get your rice cooking before you start cooking the steak as it cooks pretty quickly! Chop peppers and onion into 1-inch pieces; set aside. Add just enough vegetable oil to a large skillet to coat the bottom. Heat over high heat until very hot. Add one layer of beef strips to skillet then sauté until nicely browned. Remove from skillet then repeat this process until all beef is browned and set aside. Coat the bottom of the pan with a little more vegetable oil, reduce heat to medium-high then add chopped peppers and onions then sauté for 3-4 minutes. Add minced garlic and continue cooking for 2 minutes. Combine sauce ingredients and mix well. Add sauce and browned beef strips (with any rendered juices) to skillet. Cook and stir until sauce is thickened and peppers are tender. Note: If you'd like enough sauce to make a gravy for the rice, double the sauce ingredients. Cooking this for my Sunday's dinner. 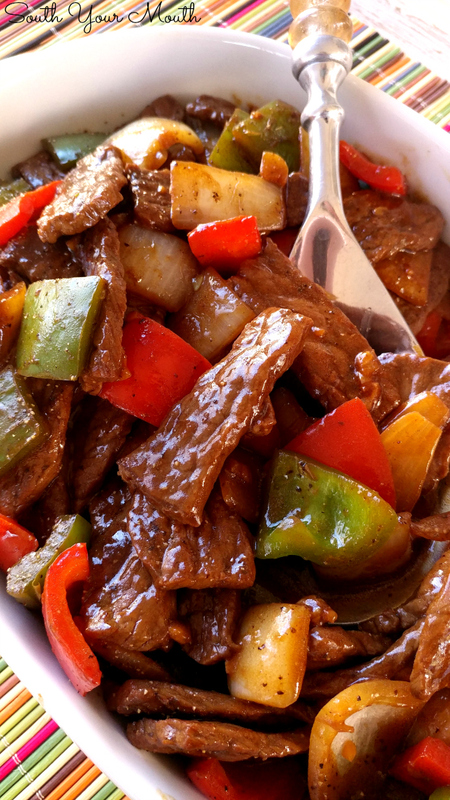 My mom used to make pepper steak similar to this, but she'd add a can of chop suey vegetables with. This sounds yummy and so easy to make. I'll have to give it a try. Oh my god… It looks so tasty!!! I made this tonight! It was delicious, but peppery. If you don't like too much pepper flavor, I would cut back on the pepper. I doubled the sauce and also added a can of water chestnuts, baby corn and snow peas. I made this and added tomato wedges! Delicious! Thank you so much! That's the way its made in St Louis with tomato wedges. Most Chinese restaurants in St Louis make it that way. I was very pleased with how this turned out! I did season my beef a little more by adding a little salt, pepper, and steak seasoning. I will not use frozen already sliced peppers again (my choice, not the recipes) as I felt they became a little too soft. This was really good! I will be making this again! Next time maybe some chilli flakes. I love your placemats...where did you get them? This is fabulous! One of the best things I have made this year. I cut the recipe in half, serving two people, made it just like the recipe. I used the option of more ginger and a bit of sugar for a more Asian flavor. I did add some carrot and broccoli, (always trying to get hubby to eat more veg). I added a bit of Siracha to my portion, and a dusting of 5 spice powder. It was wonderful-definitely will make again and again. I will try the tomato wedges next time too. Delicious!!! The family loved this. I actually used venison loin and my Instant Pot, but followed your recipe. I made this for dinner tonight it was delicious. I added a small amount of red pepper flakes and think I'll cut back on the black pepper next time. I also made your Coca cola poke cake for dessert love your recipes! 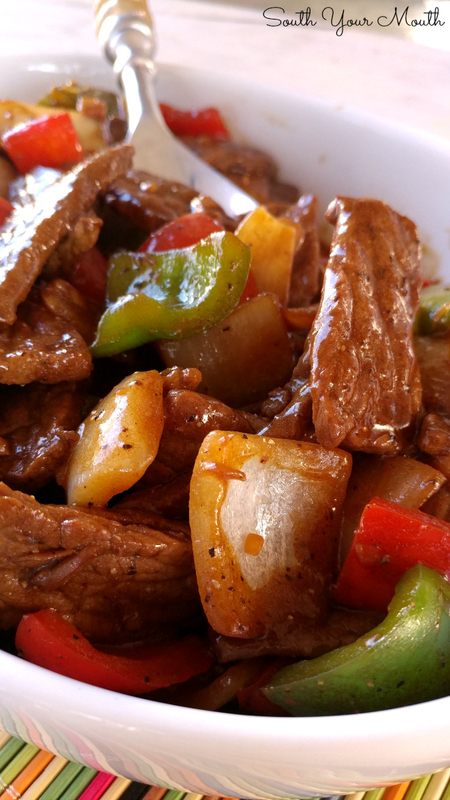 The best pepper steak recipe I've tasted. This is delicious. Thanks! This steak is divine. Thanks for the recipe! I made this tonight. The dish was delicious. Thanks for this wonderful recipe. I love recipes that are simple and family friendly like this one! Thanks for sharing! I never post on food blogs, but for once I am! This was such a great meal, I truly enjoyed it. Easy to make, easy on the budget, and FULL of flavor. Thanks so much for keeper! Now you have my mouth watering!! I love peppers and steak together! This is amazing! I added fresh ginger with the garlic and added green onions and sugar snap peas too! Little sugar at the end to taste. Thanks a bunch!! This is one of our favorite meals - the flavors are incredible!! 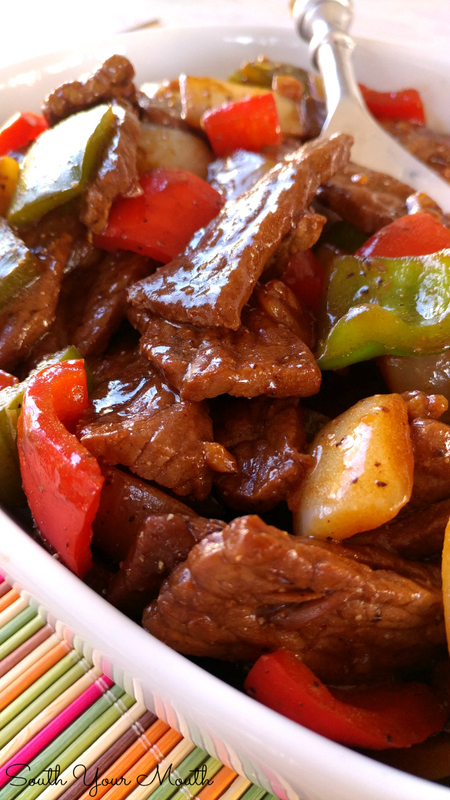 We love pepper steak for dinner and it is the perfect way to enjoy all of those garden fresh peppers! Thanks for the easy recipe!